The inaugural Pink Ribbon ‘Paddle for Pink’ will be held on Saturday August 23rd at the Cercle Nautique on Plage Marquet in Cap d’Ail. ‘Paddle for Pink‘ is a half-day introduction to Paddle Board, an activity that has been strongly recommended by the medical authorities as greatly benefiting post-operation breast cancer patients. The objective of this afetrnoon is to present this activity in a fun, non-medical way, making it accessible to all with a beach party, along with live music and workshops to be held throughout the afternoon. The importance of women being active after breast cancer surgery cannot be overstated. Lack of activity puts patients at risk of a slower recovery, painful or unpleasant complications like lymphoedema, and even permanent loss of flexibility and strength. 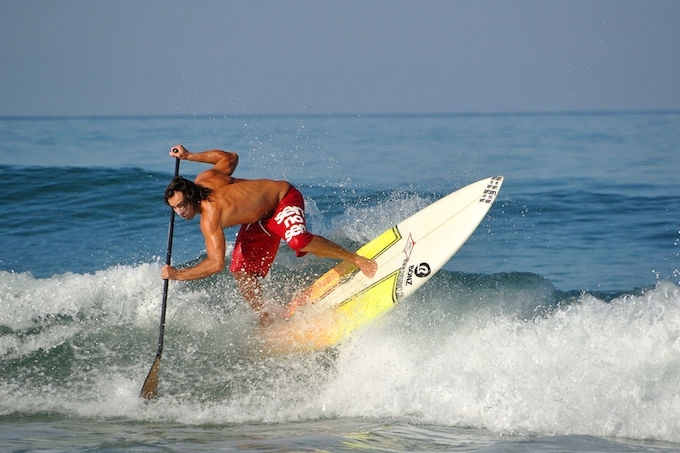 Paddle Board has been hailed for its benefits, including core stability and increasing flexibility. Pink Ribbon Monaco and the Cercle Nautique de Cap d’Ail hope to help in increasing awareness about the sport in Monaco and the surrounding area. This event, created with the help and support of local businesses, is an attempt to introduce well being and healthy lifestyle options to the attendees during a beach party, centred around an Introduction to Paddle Board. Pink Ribbon Monaco will be organising sessions where groups will have access to an instructor, a Paddle Board (SUP) and safety zodiacs. During this time, there will also be workshops relating to wellbeing in the multipurpose room located behind the beach, open to all participants. Music will be provided by ZEN. The guests for the afternoon have been selected for their positive and highly beneficial impact on the local community, and have been invited to share their activity and passion with the participants. Registration costs €35 and you may pre-register by signing up on the Facebook event page. Created in spring 2011, Pink Ribbon Monaco aims to raise funds and awareness through various campaigns and events. Pink Ribbon Monaco works closely with medical professionals from the Centre Hospitalier Princesse Grace and the Ministry of Health and Social Services to educate and create awareness campaigns, encouraging early detection through screening in the Principality and neighbouring communities. Early detection and education saves lives, it’s as simple as that. Pink Ribbon Monaco — Raising Awareness While Living Life to the Fullest!